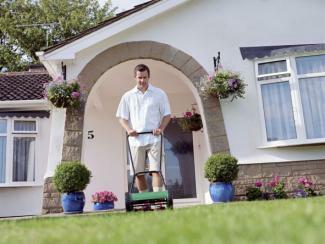 Boosting your home's curb appeal is vitally important if you are considering selling or renting. But even if you're not intending to move, simple projects to spruce up the house and yard will make each day a little brighter when you arrive home from work. A messy yard is the opposite of curb appeal. Showing that your property is well-cared for starts with a thorough tidying up. Frisbees, soccer balls, dog toys and other playthings tend to accumulate where kids and pets play. Find a handy storage bin to consolidate these and make a home for it somewhere out of site. If trash has blown in from the street or been spread around by raccoons raiding the garbage bin, cleaning it up will make an instant improvement to curb appeal. For that matter, make sure your trash and recycling bins are stored somewhere out of site, such as the back yard, garage, or behind a fence or vegetative screen. A freshly cut lawn boosts curb appeal like nothing else, but if the yard has been neglected for a while it's likely to need a bit of clean up first. Pick up any fallen branches and sticks and put them on the curb for pick up by the city. Then rake leaves and pinestraw into piles, bag them up and put them on the curb as well. Finally, once all the organic debris has been cleared, mow the lawn. For an extra nice touch, use an edger to create a clean crisp line between the turf and other planted areas. This chore requires some preparation and special tools. You may need to borrow or rent an extension ladder to access your roof. There are also a variety of special gutter cleaning tools that can make the job easier. Lay out a tarp below the edge of the roof at one end of the house. Find a firm, level spot in the yard to set up a ladder and ascend to the roof. Start at the peak of the roof and rake or sweep all accumulated leaves down onto the tarp. Clean out the gutter above the tarp using a gutter scoop or other gutter cleaning tool. Depending on the pitch of the roof, it may be easier to do this from the ladder than from the roof. Bag up the debris on the tarp and slide it down to catch the debris from the next section of the roof. Repeat steps 2 to 5 until all portions of the roof are clean. Optionally, you can use a blower for a final cleaning of the roof and a hose to rinse out the gutters. Vibrant, colorful landscaping is a key to good curb appeal. 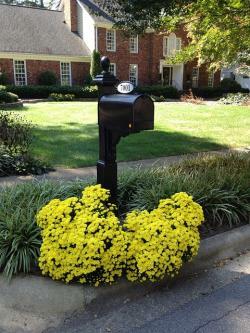 Annual flowers are a way to add instant color to the front of your home. You want to make sure they have the maximum visual impact when viewed from the street, so be strategic about where you place them - around the mailbox, at the end of the driveway, by the front door or along the front walkway are prime locations. The easiest way to incorporate annual flowers is to buy them in full bloom in decorative containers. You can also dig a bed on your own and plant a variety of seasonal flowers by seed for a fraction of the cost of a ready-to-go planter. Overgrown shrubbery looks disorganized and may block the view of your house or crowd out other plants that could add to the curb appeal. Invest in a hedge trimmer and keep your shrubbery maintained in a consistent shape. 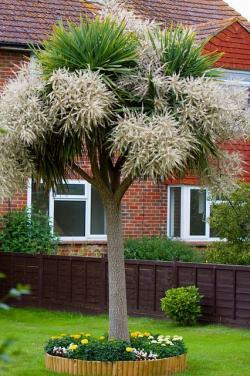 If they are really overgrown, you may need to cut the shrubs back with a saw or loppers first and then maintain them with a hedge trimmer as they regrow. Aim for a balanced, but variable look rather than having all the shrubs be the same size and shape. Sometimes a small investment in new landscaping can reap big rewards in curb appeal -- a specimen tree may cost a $100 or more, but it is nice way to tie together the landscape with a beautiful focal point. Head to the nursery and look for a tree that is currently in bloom. Make sure it is adapted to the sun and soil characteristics of your yard. It should be in a 15 gallon size or larger pot to make a significant visual impact. Choose a location that is easily visible from the street but currently lacking in a vertical landscape element. Dig a hole to the depth of the root ball and twice as wide. Remove the tree from the container and gently loosen the roots on the outside of the root ball. Place the tree in the hole and adjust it so the trunk is straight and the most attractive side is facing the street. Fill in the hole with a 50/50 mixture of compost and soil, compact the soil mixture by hand to remove any air pockets, and saturate the area with water. Spread a layer of mulch to conceal the area of disturbed soil; or, optionally, plant a bed of annual flowers around the base of the tree. 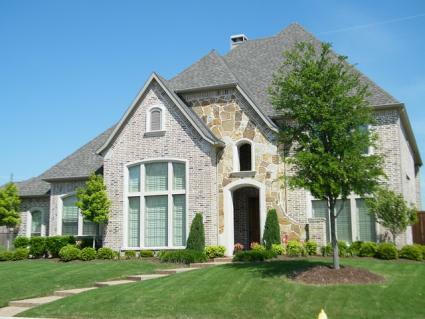 As a general rule when sprucing up your home's curb appeal, anything that is visibly broken should be fixed. And there is always room for minor improvements to make your property look more complete. An easy addition that goes along way for the time and expense involved is to lay down a fresh layer of mulch over all the landscaped areas. Mulch smothers weeds and gives a unified look to the front landscape. There are different colors and textures of mulch available, so choose one that matches the overall aesthetic -- red, brown, black, and blonde woodchips can be found; pinestraw is another option that has a nice soft appearance. 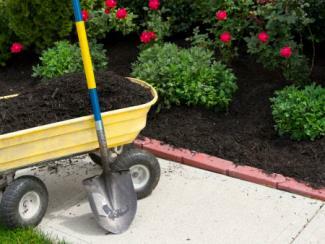 Aim to spread at least two inches of mulch so it doesn't quickly wash away and allow weeds to grow through. Is your front fence leaning? Do you have cracks in the driveway or front path? Did someone dent the mailbox? Depending on what's involved, hardscape repair can be quite costly, but fixing up anything in disrepair puts the curb appeal through the roof. Look for simple things first, like a broken picket that can be replaced or a piece of flagstone that has come loose and can be easily re-mortared. Then tick away at the larger items, prioritizing those that are most visually obvious from the street - a collapsed retaining wall along the road, for example, sends the wrong message to any prospective buyers or renters. This is one of the most obvious projects to boost curb appeal, especially if the front of the house has any chipped or peeling paint. Even if the paint is in decent shape, choosing a new designer color is a way to make your house stand out and look more attractive. Painting the entire exterior is a huge project, but sometimes just a new coat on the trim makes everything else pop out and look a bit fresher. You will have to spackle, sand, clean, and prime before putting on your color of choice. In lieu of painting, sometimes the exterior can be made to shine with a good cleaning -- a powerwasher makes this job a breeze. Put on safety goggles and protective clothing. Fill the pressure washer's reservoir with cleaning solution. Attach a garden hose to the inlet valve and turn on the water. Turn on the machine and hold the spray wand about two feet from the surface of the house. Use a smooth back and forth motion to spray off the exterior walls, soffit, fascia, and any adjacent hard surfaces (like the driveway, path, etc.). Every few minutes disconnect the cleaning solution reservoir from the flow of water and clean off the sudsy areas with clear water before the soap has a chance to dry. The recommended two-foot distance for spraying is generally safe, but the power of different machines varies. It's always better to err on the side of being farther away at first to make sure the surface is not damaged and then moving closer if more cleaning power is needed. Boosting curb appeal is a matter of choosing the smallest, simplest projects that will have the most immediate impact on the appearance of your home and yard. In one weekend, even with a very small budget, it's astonishing how much can be accomplished.